The NHS Five Year Forward View identified cancer as one of our top priorities because more than one in three of us will get cancer in our lifetimes. Better prevention, earlier diagnosis and innovative new treatments mean we have a realistic opportunity to make major improvements in survival. But large increases in the number of people being referred for cancer check-ups is placing strain on services, with one of the eight cancer waiting times standards not having been met for several years. What’s been achieved in England over the past three years? Highest cancer survival rates ever – latest survival figures show an estimated 7000+ more people surviving cancer after successful NHS cancer treatment compared to three years prior. Big expansion in cancer check-ups – over 1.7 million people urgently referred by their GP this year, up by 500,000 people compared to three years ago. 450,000 more people are being seen in under 14 days. New fast track funding for the most promising new cancer drugs approved by NICE, matched by rigorous NHS England assessment and price negotiation, has helped eliminate a £125 million overspend in the Cancer Drugs Fund budget. Six new molecular diagnostic tests funded by the NHS this year. 300,000 fewer smokers – lowest smoking rate since records began. Plain packaging introduced. NHS England’s cancer taskforce has agreed a detailed improvement blueprint to 2020, in partnership with patient groups, medical experts and research organisations. See Cancer taskforce report (30) and ‘one year on’ document (31). Better cancer survival. Within two years, more than 5000 extra people a year will survive cancer as compared to now. Expanded screening to improve prevention and early detection of cancer. Introduction of a new bowel cancer screening test for over 4 million people from April 2018. Compared to the old bowel screening test, almost a third of a million more people are expected to complete screening from 2018/19 and a fifth more cancers will be caught earlier. The introduction of primary HPV testing for cervical screening from April 2019 will benefit over 3 million women per year and could prevent around 600 cancers a year. Faster tests, results and treatment for people with worrying symptoms. Expand diagnostic capacity so that England is meeting all 8 of the cancer waiting standards, compared to seven out of eight today. We will focus specifically on the cancer 62-day from referral to treatment standard ahead of the introduction of the new standard to give patients a definitive diagnosis within 28 days by 2020. Performance incentives for achievement of the cancer 62-day waiting standard will be applied to extra funding available to our cancer alliances. By March 2018, introduce 10 new multi-disciplinary Rapid Diagnostic and Assessment Centres across England, and by March 2019, rollout Centres in each of the 16 cancer alliances. Expand access to the latest molecular diagnostics capability across England, with hi-tech test volumes set to grow from around 55,000 to around 70,000 a year. Access to the most modern cancer treatment in all parts of the country. Implement the largest radiotherapy upgrade programme in 15 years by October 2018, patients will have access to sustainable high-quality, modern radiotherapy treatments wherever they live. 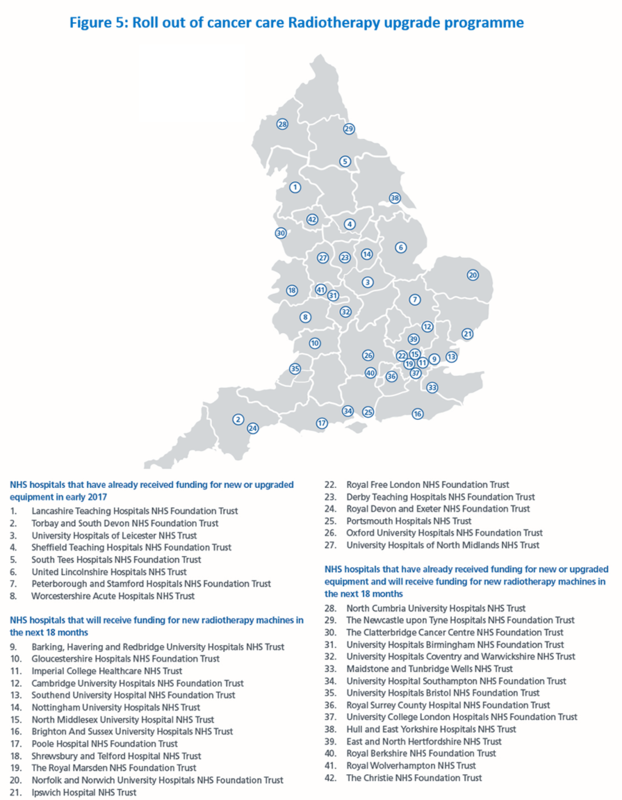 The first 23 hospitals have received new or upgraded equipment in early 2017, and over 50 new radiotherapy machines in at least 34 hospitals will be rolled out over the next 18 months, subject to the customary HM Treasury approval of the capital business case (see map). In addition, further modern cancer drugs available thanks to our reshaped cancer drugs fund and the new Accelerated Access approvals process with NICE. Roll out personalised follow up after cancer treatment, starting with half the country’s cancer alliances in 2017. Targeted national investment, including £130 million for a national radiotherapy modernisation fund. £36 million has been spent so far, with a further £94 million planned to be spent over the next 18 months. In addition a National Cancer Diagnostics Capacity Fund is supporting earlier diagnosis and living with and beyond cancer. Expand the cancer workforce: HEE to have trained 160 non-medical endoscopists by 2018, alongside 35 more places for ST1 clinical radiology training. Clear accountability and delivery chain. Performance goals for CCGs and cancer providers, matched by unprecedented transparency using the new cancer dashboard (32). CCG ratings published in July. Aligned local delivery infrastructure through 16 cancer alliances coterminous with their constituent STPs. Three cancer vanguards creating population cancer budgets so as to integrate commissioning of cancer surgery, radiotherapy and cancer drugs for 9.6 million people. Single national programme management team led by a single national cancer director and national clinical director, aligning the work of NHS England, NHS Improvement, Health Education England, Public Health England, and other Arm’s Length Bodies, and working closely with Cancer Research UK and Macmillan. See our full Cancer implementation plan (33). See more information by visiting our cancer pages.